LATIN NAME : Columba livia (‘dove’ or ‘bird of leaden or blue-grey colour’). COMMON NAMES : Pigeon, dove, blue rock pigeon, rock dove, wild rock pigeon, rock pigeon, feral pigeon. DERIVATION :The word ‘pigeon’ is derived from the Latin word ‘pipio’, meaning ‘young cheeping bird’. The word ‘dove’ is of Norse origin and first appeared in the 14th century as ‘dova’ or ‘douve’. VARIETIES : 350 recorded varieties. 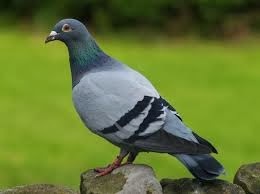 MOST COMMON: Feral Pigeon - 10-15 million in Europe. ORIGIN : Europe, North Africa and Asia. HABITAT : The wild pigeon is found in coastal areas and the feral pigeon is found almost exclusively in areas of human habitation. DISTRIBUTION: Worldwide except Sahara Desert, Antarctica and the high Arctic. European population estimated at between 17 and 28 million birds. • Pigeons are found to some extent in nearly all urban areas around the world. It is estimated that there are 400 million pigeons worldwide and that the population is growing rapidly together with increased urbanization. The population of pigeons in New York City alone is estimated to exceed 1 million birds. • Sexes look nearly identical, although males are larger and have more iridescence on their neck. • Juveniles are very similar in appearance to adults, but duller and with less iridescence. • Pigeons are highly dependent on humans to provide them with food and sites for roosting, loafing, and nesting. They are commonly found around farm yards, grain elevators, feed mills, parks, city buildings, bridges, and other structures, although they can live anywhere where they have adequate access to food, water and shelter. • Pigeons feed in flocks and will consume seeds, fruits and rarely invertebrates, although can subsist just fine on street scraps. • Pigeons require about 1 ounce (30 ml) of water daily. They rely mostly on free-standing water but they can also use snow to obtain water. • The average pigeon requires 30 grams of dry matter per day, roughly 10% of their body weight. • Pigeons are monogamous and typically mate for life. • Female pigeons can reach sexual maturity as early as 7 months of age. • Pigeons build a flimsy platform nest of straw and sticks, put on ledge, under cover, often located on the window ledges of buildings. • Eight to 12 days after mating, the females lay 1 to 3 (usually 2) white eggs which hatch after 18 days. • Condition at Hatching: Helpless, with sparse yellow or white down. • Chicks leave the nest in 25-32 days (45 days in midwinter). • The male provides nesting material and guards the female and the nest.